A consensus on digital ulcer (DU) definition in systemic sclerosis (SSc) has been recently reached (Suliman et al., J Scleroderma Relat Disord 2:115-20, 2017), while for their evaluation, classification and categorisation, it is still missing. The aims of this study were to identify a set of essential items for digital ulcer (DU) evaluation, to assess if the existing DU classification was useful and feasible in clinical practice and to investigate if the new categorisation was preferred to the simple distinction of DU in recurrent and not recurrent, in patients with systemic sclerosis (SSc). DeSScipher is the largest European multicentre study on SSc. It consists of five observational trials (OTs), and one of them, OT1, is focused on DU management. The DeSScipher OT1 items on DU that reached ≥ 60% of completion rate were administered to EUSTAR (European Scleroderma Trials and Research group) centres via online survey. Questions about feasibility and usefulness of the existing DU classification (DU due to digital pitting scars, to loss of tissue, derived from calcinosis and gangrene) and newly proposed categorisation (episodic, recurrent and chronic) were also asked. A total of 84/148 (56.8%) EUSTAR centres completed the questionnaire. DeSScipher items scored by ≥ 70% of the participants as essential and feasible for DU evaluation were the number of DU defined as a loss of tissue (level of agreement 92%), recurrent DU (84%) and number of new DU (74%). For 65% of the centres, the proposed classification of DU was considered useful and feasible in clinical practice. Moreover, 80% of the centres preferred the categorisation of DU in episodic, recurrent and chronic to simple distinction in recurrent/not recurrent DU. For clinical practice, EUSTAR centres identified only three essential items for DU evaluation and considered the proposed classification and categorisation as useful and feasible. The set of items needs to be validated while further implementation of DU classification and categorisation is warranted. Observational trial on DU (OT1) is one of the five trials of the DeSScipher project (ClinicalTrials.gov; OT1 Identifier: NCT01836263, posted on April 19, 2013). In systemic sclerosis (SSc), the pathophysiology is characterised by immune, endothelial and fibroblast dysfunction  and microvascular involvement is one of the most important features of the disease . The evolution of vessel involvement frequently leads to tissue ischemia and formation of digital ulcers (DU) that are considered as a significant clinical burden [3, 4] reducing patients’ quality of life . In SSc, the compelling need for a precise definition  has eventually led to a consensus on DU definition , while for their evaluation, classification and categorisation, an overall agreement is still missing . Since different types of DU may occur in SSc, a DU classification according to their main features into DU associated digital pitting scars, DU associated with calcinosis, DU due to loss of tissue not associated with DPS or calcinosis (Pure DU) (Fig. 1) and DU associated with gangrene has been proposed . Recently, a new categorisation of DU into episodic, recurrent and chronic DU, derived from the analysis of more than 1400 patients in Europe, has been suggested . DeSScipher is the largest European multicentre project aimed to decipher the optimal management of SSc. It consists of five observational trials (OTs) focusing on DU (OT1), hand arthritis, interstitial lung disease, pulmonary hypertension and heart disease. The aims of this study were to identify in SSc a set of essential items for DU evaluation in clinical practice, starting from a large core of items contained in the OT1, to assess if the existing DU classification was useful and feasible in clinical practice and to investigate whether the DU categorisation was preferred to the simple classification of DU (i.e. recurrent and not recurrent). Observational trial on DU (OT1) is one of the five trials of the DeSScipher project (ClinicalTrials.gov; OT1 Identifier: NCT01836263, April 19, 2013). The DeSScipher project  was based on the use of the EUSTAR (European Scleroderma Trials and Research group) long-term databank MEDS (Minimal Essential Data Set) accessible online . The structure of the multicentre and international, prospective, longitudinal EUSTAR database has been described previously . In OT1, the efficacy of different vasoactive/vasodilating drugs on DU prevention and healing was analysed considering a large number of clinical items on cutaneous lesions of the upper and lower limbs. A tailored approach of DU classification according to their main features was adopted: DU associated digital pitting scars (DPS), DU associated with calcinosis, DU due to loss of tissue not associated with DPS or calcinosis (Pure DU) (Fig. 1) and DU associated with gangrene . Since recurrent DUs are a challenge in clinical practice, these data were also collected in the OT1. For the purpose of the DeSScipher observational trials, the MEDS online database was extended and adapted according to the needs of the individual projects. The OT1-specific DeSScipher dataset included more than 30 supplementary clinical items in addition to three items on upper limb lesions contained in the original MEDS online database (digital ulcers, pitting scars on fingertips and gangrene). Episodic DU (rarely recurrent DU) defined as DU detected only at one follow-up visit and absence of DU at the remaining follow-up visits. Recurrent DU (frequently recurrent DU) defined as DU detected at two or more follow-up visits and absence of DU on at least one follow-up visit. Chronic DU defined as one or more DU and/or new DU detected at every follow-up visit. This categorisation was published after the beginning of the OT1 study and therefore could not originally be adopted. The questionnaire was administered to all EUSTAR centres by online survey via SurveyMonkey commercial software. The names of the EUSTAR co-workers are provided in Additional file 1. Ethical approval of DeSScipher OT1 had been obtained from all participating centres’ local ethics committees (project coordinator’s ethics board: Ethics Review board of the Justus-Liebig University Giessen, Germany, approval no 02/13; partner centres’ ethics review boards: University of Zurich, Switzerland; University of Paris, France; University of Florence Italy; The Second University of Naples, Italy; University of Basel, Switzerland; University College of London, UK; University of Berlin Charité, Germany; University of Pécs, Hungary; University of Leeds, UK; and contributor centres’ ethics boards (additional 21 centres)). Each patient signed a written informed consent form. Moreover, there was an external data monitoring as a part of study quality control. The assessment of the completion rate of different clinical items included in the study was performed by SPSS software, version 22. Responses to the online questionnaire were analysed by the SurveyMonkey commercial software. OT1 contained 35 clinical items on upper and lower limb cutaneous lesions; 18 were on the upper limb DU distal to PIP (Table 1). The items on upper limb DU distal to the PIP and their data completeness are shown in italic letters in Table 1. A significant number of centres (64%) agreed that the DU classification adopted in OT1  was useful to identify DU and their characteristics fundamental to shape the management in everyday clinical practice. Concerning the new categorisation of DU , 80% of the centres preferred the distinction in episodic, recurrent and chronic DU compared to the simple division in recurrent and not recurrent DU. This study introduces for the first time the concept of essential clinical items for the evaluation and management of DU in SSc. These essential items might become a useful tool for physicians treating DU in everyday clinical practice and may also become outcome measures to be used in clinical trials. The item considered as the most important for DU management was the number of DU defined as a loss of tissue, voted by more than 90% of participants. Thus, the DU due to loss of tissue or pure DU, referring to a DU occurring neither in association with DPS nor with calcinosis, was considered as the most important form of DU in SSc. This finding underlines the perceived importance of the clinical burden of this type of DU, since they usually represent the most severe type of DU where vasoactive/vasodilating drugs used for DU treatment have been tested. It is interesting to remark that the assessment of other types of DU, as those due to DPS or to calcinosis, was not evaluated as important in clinical practice. This may likely reflect the fact that these lesions are usually considered mild and not disabling. Recurrent DU and number of new DU were the second and the third chosen essential items, respectively. The number of new DU was considered more important than the number of healed DU. In fact, the DU occurrence has been correlated to a worse outcome and a poor quality of life in large prospective SSc cohorts [4, 5, 14, 15]. The number of new DU was included by participants among the essential items, being probably considered as an indicator of clinical worsening and more severe disease. Unexpectedly, only 20% of centres considered the number of healed DU useful and feasible for DU management in clinical practice as this was the least voted item. This result may reflect a difficulty in assessing the healing of each DU in clinical practice, since not always all patients are seen at time interval useful to depict the healing of all lesions. Interestingly, only half of the participants chose DU distal to the proximal interphalangeal joints as an important item. This indicates that not all clinicians considered the site of DU important for their management. However, DUs located on the fingertips usually follow tissue damage due to chronic ischaemia , while DUs on other locations may also be due to cutaneous retraction and microtrauma, thus being less responsive to vasodilating/vasoactive drugs. Surprisingly, for less than 60% of the participants, the presence of infection was essential for DU management. This may indicate insufficient attention to this item even by centres expert in SSc management. Accordingly, there is a scarce number of scientific publications on infectious complications of DU in SSc [3, 16, 17], and up to now, no study has addressed the impact of infection on DU healing. Data published till now indicate that infection is frequent in patients with DU. Giuggioli et al. observed in a retrospective study that 51% of 82 SSc patients with DU presented infected DU over a three-year observational period . Moreover, in the analysis of 1459 patients taking part of the large DUO registry, soft tissue infection requiring systemic antibiotics has been observed in 60% of patients with one or more DU at every follow-up visit over 2 years . 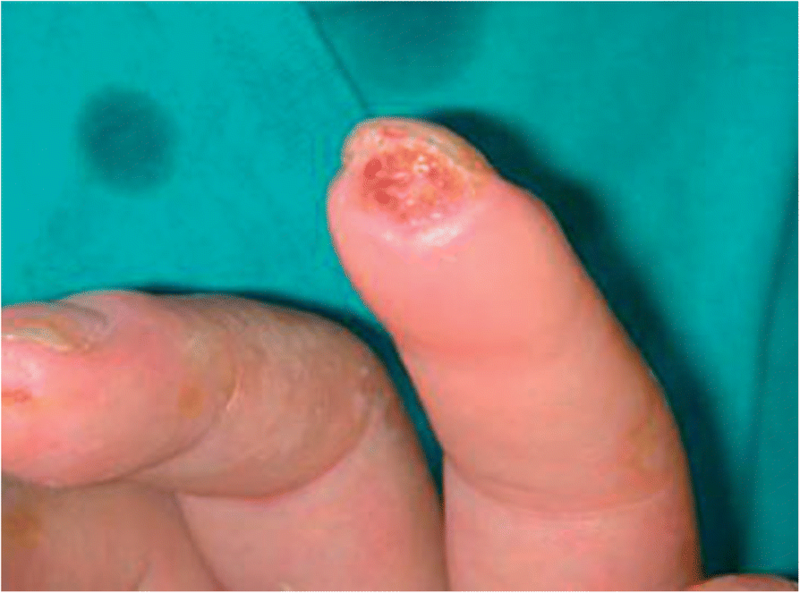 In addition, it is a common clinical observation that infected DUs have impaired healing potential in SSc, and it has been shown that infected wounds and ulcers have a worse outcome in other clinical settings . It is of note that gangrene and previous amputation were considered important for DU management only by 60% and 50% of centres, respectively. However, a recent study on more than 4600 patients demonstrated that gangrene is still a common event in current practice, occurring in 18% of patients with SSc-related DU . Recurrent DUs are a real clinical challenge in SSc. Accordingly, recurrent DU represented the second most voted clinical item in our study. Simple distinction in recurrent and not recurrent DU may not fully depict the level of DU-related disease burden. For this reason, a new categorisation, based on the longitudinal pattern of DU recurrence over the 2 years in the registry containing more than 1400 patients across Europe has been recently proposed . The participating centres in our study have recognised the importance of this categorisation, as more than 80% of them agreed on its utility and feasibility in clinical practice. In fact, it may help to identify patients with more severe DU disease burden that may require more intensive treatment, as already suggested . The aim of the OT1 was to evaluate the best vasodilating/vasoactive therapy for DU prevention and healing through observational non-interventional design. In order to distinguish between different types of DU that might have different response to the treatment, OT1 needed to classify DU. Since there is no universally accepted classification of DU in SSc, OT1 adopted the one proposed by Amanzi et al. based on observations extrapolated from real life data on more than 1500 DU . Our study has shown that this classification may be useful and feasible in everyday clinical practice as indicated by 64% of the participating centres. The strength of this study is that the items were already pre-selected based on the analysis of data availability in the DeSScipher project, the first prospective multi-centric European study that expressly addressed DU management in SSc, with a study population of more than 1600 SSc patients. More than 80 expert centres in SSc management across the world were included in this survey. The limitation of this project is that the online survey was based on the opinion of a single expert of each individual centre. In addition, the survey contained only clinical items (DU features assessed by the clinical history and/or simple clinical examination). Several laboratory and instrumental items have been collected in the OT1 database. The importance of some of these parameters for DU management, such as capillaroscopic findings shown to be risk factors for DU occurrence [20, 21], should be addressed in the future. Our findings now need prospective validation using data-driven approach on large SSc cohorts in order to confirm the real usefulness of these essential items and the role of the proposed DU classification and categorisation in real-life clinical practice. For clinical practice, DeSScipher/EUSTAR centres identified only three essential items for DU evaluation. They considered the proposed classification and categorisation of DU as useful and feasible. The set of items needs to be further validated while further implementation of DU classification and categorisation is warranted. This study, as part of the DeSScipher project, was supported by the European Community’s Framework Programme 7 [FP7-HEALTH-2012.2.4.4-2 Observational trials in rare diseases]; grant agreement N° 305495. The datasets generated during and/or analysed during the current study are available from the corresponding author on reasonable request, after permission of EUSTAR (European Scleroderma Trials and Research group). JB contributed to the design of the study, acquired, extracted, analysed and interpreted the data and drafted and edited the manuscript. DH analysed the data, edited and revised the manuscript. SBR, GA, JA, LC, CPD, OD, LCz, MF, SG, VKJ, LV, BM, SN, GR, ES, IT, SV, UAW, YA, UML and FDG were substantially involved in acquisition and interpretation of the data and revised the manuscript. MCC designed the study, interpreted the data, edited and revised the manuscript. All authors agreed to be accountable for all aspects of the work in ensuring that questions related to the accuracy or integrity of any part of the work are appropriately investigated and resolved and gave final approval of the version to be published. Ethical approval of DeSScipher OT1 has been obtained from all participating centres’ local ethics committees (project coordinator’s ethics board: Ethics Review board of the Justus-Liebig University Giessen, Germany, approval no 02/13; partners centres ethics review boards: University of Zurich, Switzerland; University of Paris, France; University of Florence Italy; The Second University of Naples, Italy; University of Basel, Switzerland; University College of London, United Kingdom; University of Berlin Charité, Germany; University of Pécs, Hungary; University of Leeds, United Kingdom; and contributors centres ethics boards (additional 21 centres)). Each patient signed a written informed consent form. The authors report personal fees and non-financial support by the European Community’s Framework Program 7 [FP7-HEALTH-2012.2.4.4-2 Observational trials in rare diseases]; grant agreement no. 305495.
https://www.unigiessen.de/faculties/f11/facilities/desscipher-en?set_language=en. Accessed 30 July 2018.
www.eustar-online.org. Accessed 30 July 2018.